I came prepared. The night before going on the field trip to Belleville, I sat on my bed, thinking, “What should I bring to the 19th arrondissement?”. I had heard from many people, who are from my hometown in Taichung, Taiwan, and who have been to Paris, that the 19th arrondissement is not a safe place to go. However, Professor Attali told us during class that this area has a bad reputation but is actually not dangerous. And she should know, as she had grown up there. Although Professor Attali had given me a different perspective on the 19th, I was still concerned for my safety. After all, everything I had heard about the area had been mostly negative. I would have to overcome my fears, even though I knew it would not be easy. Before we departed from Parsons Paris, I left my bag in the security room on the ground floor. When I stepped out into the street, I was wearing a jacket with zip pockets that kept my Navigo card safe and concealed my personal safety alarm. Holding my pencil and A5 sketchbook, I left for Belleville with the class. We took the metro on line 1 towards Ch. de Vincennes, transferred at Hôtel de Ville, took line 11 towards Mairie de Lilas and got off at Belleville. Line 1 was fine as usual, but the trains on line 11 seemed older. The dim, yellow light lit the interior of its cars, shining on the seats. The train was not sparkling clean, but the warm light created a cozy atmosphere. It reminded me of those old-fashioned trains that I have seen in Western movies. It was moving really, really fast, so fast I felt the whole metro shaking. As we sped through the underground tunnels, hearing the screeching noises caused by the friction of the wheels of the metro against the tracks, I noticed that you had to push the metal handles on the door in order to exit. I had seen those on other metro lines. A few of my classmates and I held onto the four-sided handrail that stood in the center of the car. There were four rows of seats beside it. A man joined us, sharing a handrail with one of the students from our group. Before the metro pulled into the next station, just as the doors were about to close, the man attempted to exit. Some friends of my parents had told me that they had seen people hop onto a metro, steal what they wanted and then jump off the metro as the doors were closing. But I had not been worried about being pickpocketed. The guy standing next to us did not make any suspicious moves, and none of my valuables were visible. Walking through the underground passageways that spread in several directions, I almost lost sight of the teacher and classmates who had gone far ahead towards the exit. Worried that those behind wouldn’t catch up, I walked slow enough for them to see me, but fast enough to know which direction the group ahead had gone in. The teacher led us through the streets. We all stayed in a large group and occasionally stopped when the teacher noticed special sites. She briefly discussed them and then we continued our tour of the unfamiliar streets. My classmates took out their phones to take photos. I hesitated for a minute or two, afraid that my light phone would be snatched away. But then I took mine out too. I am glad that I took photos, even though I took them all in a rush. There was one thing in particular that everyone who had been to the 19th warned me about: Never take your phone out, whether in the metro or on the streets. One of my French teachers in Taiwan, who had grown up in France, put her phone in her back pocket. It was stolen just as she was passing through one of the turnstiles. Considering our current surrounding, as soon as I finished taking photos, I put my phone back into my jacket pocket and zipped it tightly. As we continued on our tour, we turned left and then right, and strolled for a few blocks until we reached Parc de Belleville. There was an observation deck with poles that contained sketches of humans in fantasy-like situations. Some of their heads were stuck into the clouds. Mosaics carved colorful trees and faces on the poles alining the edge of the balcony. The top view of the city was beautiful. I walked with two other classmates until we arrived at the entrance to the garden. When I got to the grass, I couldn’t believe the view in front of me. It was spectacular. There was a bundle of flowers and leaves that looked extravagant. I took a photo of my classmate. For the first time, I saw many bees flying around plants, just as in Disney storybooks. I lived in a city that contained mosquitos. This was an unusual sight for me. I wandered further into the shady green inner parts of the garden. I enjoyed being able to relax and worry about nothing but appreciating nature. I loved being detached from manmade society, immersing myself in a realm of nature and wonderment. The sunlight enhanced the cheerful atmosphere. People were picnicking and enjoying the sun. The green grass outlined the flowers. The sound of trickling water from a waterfall echoed in the garden. Winding steps led us down into a forest-like area with cool shade. Then, it was time for us to go back to class. I did not want to leave. I wanted to stay here forever. I found in this places that I had been so worried about, a place of peace that attracted me to its natural beauty, where people were not thinking about stealing but more about living in harmony with nature, free from worries and doubts. 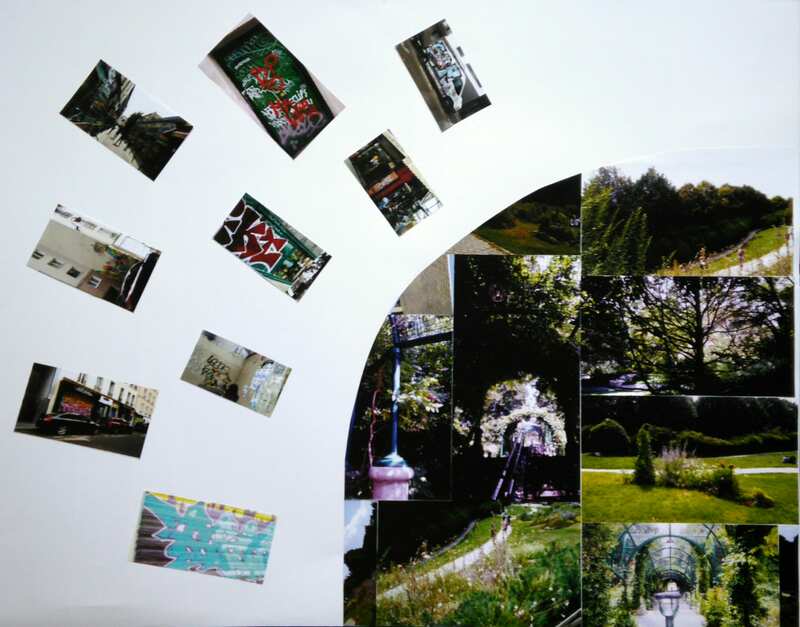 The different formations of photos aim to contrast the 2-dimensioned man-made artworks on the line-oriented streets and the 3-dimensioned spectacular natural creation in Parc de Belleville. The photos displayed in straight line directions towards the left are photos of graffiti that I took in the streets of Belleville. The photos displayed in a spherical shape towards the right-hand corner are photos of the nature that I took in Parc de Belleville.